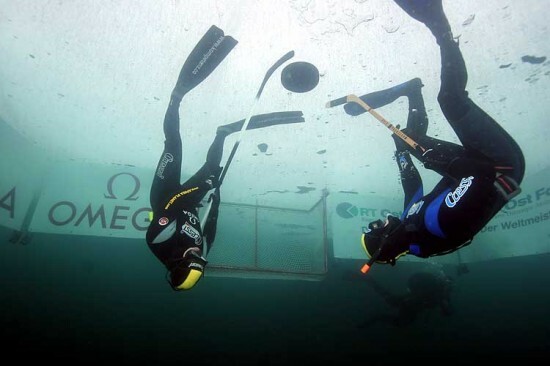 Underwater Ice Hockey is a new sport that originated in Austria and is increasingly popular among freedivers and extreme sports enthusiasts. Not to be confused with underwater hockey, which is played in indoor swimming pools, underwater ice hockey is practiced in a 6 meters wide by 8 meters long rink under the icy surface of a frozen lake. After cutting a square hole in the thick ice, players wearing wetsuits and carrying hockey sticks jump into the ice-cold water and try to guide a floating puck into their opponents’ goal. Think of it as an upside-down game of hockey. Underwater ice hockey players need to have excellent breath-holding abilities, considering they’re not allowed to play with any kind of breathing apparatus. Considering matches can get pretty physical, players need to surface about every 30 seconds, for a breath of fresh air. Because divers can easily get disoriented during a game, in case one of them is to exhausted to reach the hole, or can’t find it, four divers equipped with oxygen tanks supervise every match. Underwater ice hockey periods last 10 minutes, and players are allowed 10 minute breaks to warm up. The world’s first ever Underwater Ice Hockey World Cup was held in Weissensee, Austria and was won by a team from Finland. Because of the extreme conditions it’s played in, fans present at the scene have to watch the underwater action on monitors.